In January 2016, we announced our partnership with US private equity firm, FTV Capital. We chose to partner with FTV Capital specifically because of their industry expertise, knowledge of the UK market and understanding of our business model and ability to support our future growth. Fast forward nine months and we were invited to attend and present at their Annual Partner Conference. Daniel Harrison, Mark Henderson and Neil Johnson, three of our Senior Partners, attended the event, which was attended by leading influencers within the finance and technology industry. “The conference was a unique blend of the FTV team, limited partners, leading institutions and fund managers from around the world and fellow Portfolio companies. This meant that the discussions had with fellow attendees was varied, dynamic and engaging. We were honoured to have been involved in this event as it granted us exposure to world leading firms and their plans and ambitions. “The conference offered an element that allowed us to demonstrate our ability to network closely with others during the 121 sessions. These meetings allowed us to create new relationships with a variety of different individuals and organisations, something that we found most valuable and can only help True Potential further in the future. “Our client-first approach means that we always look at what such an involvement could mean for our clients. With regards to the conference, we have been given leading exposure to finance and technology thinking and trends. I also believe that it has allowed us to delve deeper into how we can develop our business further. “What I found interesting was that the UK was highlighted as being in a good position, albeit a complicated one and that the opportunities for investment in the UK are hugely underplayed. It is far too common for some commentators to look at investing at a micro level, UK only, whereas we, FTV and the other attendees think on a world-wide scale. This only reaffirms that investment is a worldwide game which gives us huge grounds for continued optimism. “In terms of other optimistic themes, FTV have recently closed their latest fund, Fund V, which is their largest and most successful fund to date. We’d like to offer our congratulations to the team and look forward to continuing to grow with FTV, break records and foster even more success. We also saw that the UK financial advice sector is ahead of its US counterparts as we offer advisers a regulatory service where fees are paid. The US are still using a commission based system, however, they have latched on to this and are beginning to catch up. Conversely, the US is already ahead in terms of how much more asset under advice an adviser works with compared to the UK, with 5-10 times more. “The conference was our first face-to-face engagement with FTV’s wider network and gave us the opportunity to present True Potential to an audience who may not have known of us before. Myself, Mark and Neil presented the success story of True Potential to date, highlighting key growth areas including client engagement and the success of our True Potential Portfolios. 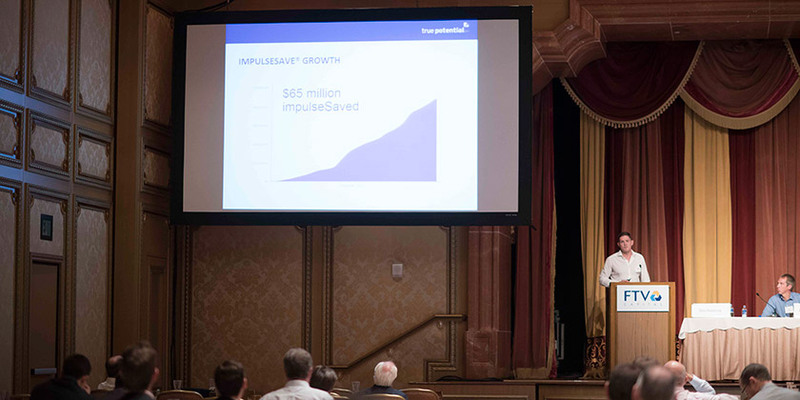 In addition, we demonstrated our technology live including the power and ease of impulseSave® and the feedback given was nothing short of positive and well received by all in attendance.